What Would George Washington Think of Trump? The Smithsonian’s National Museum of American History houses the uniform of President George Washington. A man once occupied that uniform who presented an imperfect but defining set of values and policies that would mold the foundation of the United States. For the past 242 years, the Union has survived despite monumental challenges at home and abroad. The current occupant of the White House, Donald Trump, seems so antithetical to Washington’s vision for the country and how so many Americans view the characteristics a president should embody and the experience a president should bring to the office. What would Washington think of Trump if he was alive today? An examination of his character, views, and policies offers insight. Washington didn’t affiliate with any political party and despised partisanship. He believed partisan politics were ruinous to the fabric of American society. In his Farewell Address, he warned Americans of the divisive nature of political parties. Trump thrives on digging up long settled issues, never letting go, and demonizing his opposition. He calls people names reserved for middle school playgrounds and bullies without remorse. He routinely demonstrates his inability to rise above any fray. Washington surrounded himself on the battlefield and in government with the most competent leaders of his time. He was renowned for his unique ability to judge talent. His appointments included Alexander Hamilton as Secretary of the Treasury, Thomas Jefferson as Secretary of State, Henry Knox as Secretary of War, and James Madison as an advisor. Trump filled his cabinet with people woefully unqualified for their jobs and notorious for their political hackery. Their resumes only needed to communicate their blind loyalty to him. Rick Perry has no background in nuclear weapons, Scott Pruitt was one of the EPA’s most fierce opponents, Ben Carson has no experience in public housing, Steve Bannon has no National Security Council credentials, and Betsy DeVos has no formal background in K-12 or higher education. Trump’s son-in-law was a real estate agent with no government experience and now oversees Middle East peace and the nation’s opioid crisis. Trump recently attempted to appoint Sam Clovis to a top-level science position at the USDA. Clovis has no science credentials. Washington worked with Alexander Hamilton to reduce the debt amassed to pay for the American Revolution in order to keep the nation’s finances in order. He also developed peace treaties with Indian tribes. Trump’s current tax plan would balloon the national debt by an estimated $1.5 trillion. Rather than extend olive branches, Trump has used bombastic threats via Twitter to escalate feuds. He has refused to embrace climate change science or take steps to mitigate it, alienating allies throughout the world and further threatening the future of the American democracy. Washington administered the American government with integrity and restraint. He understood his actions would set a precedent for all those who followed, thus, he maintained his incorruptibility. Trump is notoriously unethical, petty, pretentious, and vindictive. He defrauded customers at the deceptively named Trump University and through other business dealings that have been chronicled ad nauseam. Trump couldn’t let alone the DNA exonerated Central Park Five, the racist sham of a search for President Obama’s birthplace, or Gold Star parents who dared criticize him. He regularly debases the free press and pathologically lies so much that it’s hard to believe he’s lying. He said he has “one of the great memories of all-time” but catches a case of selective amnesia when asked about matters that threaten to expose his con game. Washington heroically led the Continental Army as its Commander during the American Revolution. He was a reluctant leader who shied from the limelight and a patriot who risked his life for his country. The stories of his bravery, endurance, and survival are legitimate and legendary. Trump avoided Vietnam through multiple deferments claiming bone spurs. Trump’s patriotism is recently manufactured, demonstrated by flag hugging and anthem standing while simultaneously outsourcing jobs and signing executive orders that conflict with patriotic values. Trump repeatedly asked foreign entities to release stolen emails to harm his election opponent, pitting a foreign adversary against his political opponent for personal gain. Washington believed in the judicial process. He signed the Judiciary Act that limited his powers, downplayed his authority, and showed reverence for the U.S. Constitution. It’s old saw by now but Trump has sought to expand his power and bypass the U.S. Constitution, mocked a judge’s nationality, undermined federal judges, cast a shadow over the judicial process, publicly prejudged cases, and openly criticized the CIA, FBI, and Justice Department in an unprecedented manner. With the loyalty pledge he fired at the director of the FBI, he may even have obstructed justice. Washington supported charity and the poor but did so without fanfare. Trump has spoken often about giving to charity but has repeatedly been caught not making said donations. Washington was quiet and humble despite his historic achievements. Trump’s narcissism and bragging are his hallmark. He lacks any semblance of etiquette, decency, and good judgement. He boasted about his election win in front of the CIA Memorial Wall, threw paper towels at hurricane survivors, told reporters’ children not to be like their parents, gloated about sexually assaulting women, and insulted Gold Star parents. Washington kept his religion private and believed strongly in the separation of Church and State. He was accepting of different religious beliefs. Trump rarely attends church nor has he shown a history of being involved in religious activities yet often speaks about religion as if it’s a driving force in his life. His religious speeches are a cringe-worthy but shameless effort to fire up his base. He uses tired wedge issues such as the need to wish people a Merry Christmas to portray Christians as victims of religious diversity. By all accounts, Trump doesn’t share any of the traits that led to Washington’s success. Trump has snarled the republic in his web of incompetence and deceit. He thrives on the jeers he creates with his toxic cocktail of dictatorisms and fabrications as his supporters throw their moral compasses overboard like East India Company tea. Never in the country’s storied history has there roamed and loafed such a hypocritical, phony mess masquerading as president. If Washington knew the battles of the Revolution would lead to the know-nothing, TV addicted, Twitter vomiting, bloviating Trump, he may have laid down his arms at Lexington and Concord. No doubt if Trump was at Bunker Hill, he would have asked for a pitching wedge. According to his diaries, Washington had his first tooth pulled at 24. 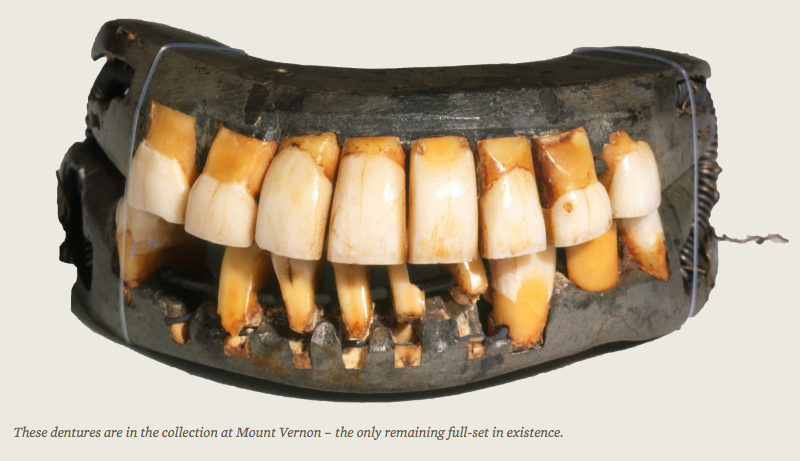 He suffered from “aching teeth, lost teeth, inflamed gums, ill-fitting dentures, and a host of other dental miseries.” It’s hard to imagine that Washington was able to accomplish so much while wearing this primitive device. He reportedly had to constantly clench his teeth shut to keep the spring from opening his mouth–one of the reasons he rarely spoke. Washington withstood freezing cold temperatures, severe injuries and disease, hunger, constant threats to his life on the battlefield, and the struggles of forming a new nation. In contrast, despite living in excess with every convenience at his disposal, Trump can’t even withstand criticism from Rosie O’Donnell. By the time his presidency ends and the wrath of his reign has decimated the landscape of American morality and prestige, everyone’s teeth may look like Washington’s. As usual very well written. I have been grinding my teeth more than ever, since Nov 2016. G.Washington was a great man who loved his spouse, Martha, and married a widow with children. He loved them as his own. What a Guy!!!!! Drumpf does nothing; at all, to compare with anyone of any moral character. The only thing that keeps me from collapsing in a heap of despair is Robert Mueller. Presidents’ Day is a month away; so here’s something to chew on.